Monteverdi’s compositional style and the innovations that he introduced are, at least in part, the result of a parallel evolution of musical instruments. The exhibition Monteverdi e Caravaggio, sonar stromenti e figurar la musica (“Monteverdi and Caravaggio: Playing instruments and depicting music”), at the Museo del Violino from 8 April to 23 July, 2017, will reconstruct the L’Orfeo orchestra using original instruments from Monteverdi’s era, selected based on the indications recorded in the first printed editions of the opera, which was performed for the first time exactly 410 years ago. Indeed, the score specifies a well-defined ensemble: “duoi gravicembali, duoi contrabassi de viola, dieci viole da brazzo, un’arpa doppia, duoi violini piccoli alla francese, duoi chitaroni, duoi organi di legno, tre bassi da gamba, quattro tromboni, un regale, duoi cornetti, un flautino alla vigesima seconda, un clarino con tre trombe sordine” (“two harpsichords, two double-bass viols, ten arm viols, one double harp, two small French violins, two bass lutes, two organs with wooden pipes, three bass viols, four trombones, one regal, two cornetts, one small recorder, one high trumpet with three soft trumpets”). The list not only bears witness to the musical customs of the age but anticipates the baroque trends in Italy, with the dominance of “arm viols” (viole da braccio) over the bass “leg viols” (viole da gamba). The instruments on display have been chosen according to philological and aesthetic criteria and come from major Italian and international collections. Particular priority was given to instruments that have been preserved in their original condition, or restored to it, without the interventions that in subsequent centuries proved necessary to perform 17th and 18th century repertoires. Where this has not been possible, a copy in the late-Renaissance configuration will be presented alongside the modernized instrument. The exhibition, curated by Fausto Cacciatori, Virginia Villa, Lorenzo Girodo and Massimiliano Guido will be located within the museum space, to underline the affinities that already linked violinmaking and music between the 16th and 17th centuries. It will also be possible to trace the invention of the violin thanks to Cremona’s Amati family and revisit the contribution of the Brescian school, testified to by the work of Gasparo da Salò e Giovanni Paolo Maggini, and the Venetian school. Monteverdi’s L’Orfeo, has a happy ending: the hero becomes a symbol of love overcoming death. The Apollonian and salvific role of the music has inspired many artistic representations. 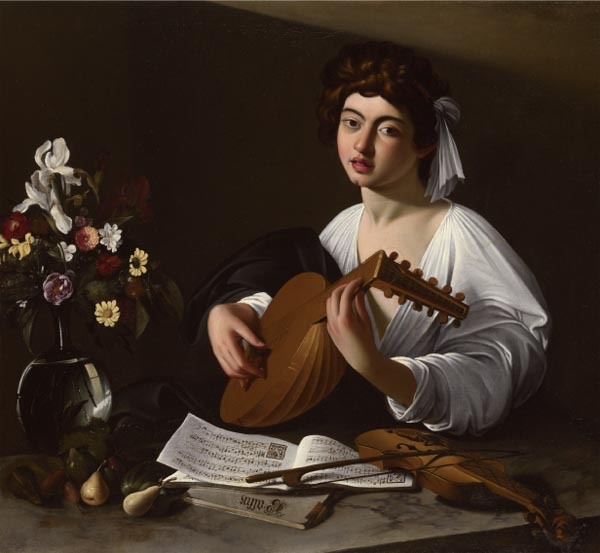 Among the most famous is undoubtedly Caravaggio’s Lute Player. This wonderful work, presented in Cremona as an introduction to musical instruments and from a private collection, has a fascinating history: it is the original painting made in 1597 by the great painter for Cardinal del Monte. During the exhibition period, conferences and meetings on subjects relating to the study of musical instruments and performance practice in Monteverdi’s time will be organized in collaboration with other local institutions. The painting, acquired by Henry Somerset, Duke of Beaufort, probably from Antonio Vaini, Grand Prior of the Knights of Malta, for 200 scudi in 1726, was kept by the Duke’s descendants at Badminton House (Gloucestershire) until 1960. Stored out of sight for a long time, and thought to be a copy, it was finally recognised as an original by Sir Denis Mahon. The work was the subject of a dedicated exhibition, along with a publication edited by Martin Kemp, Claudio Strinati, Clovis Whitfield and the author (La natura morta italiana da Caravaggio al Settecento, Exhibition catalogue, Palazzo Strozzi, Florence, 26 June – 12 October 2003. Milan: Electa, 2003). This was the first time it had been on public display. A painting with this subject is described by Baglione (1642, p. 136), who focuses on certain details: “And he also painted for the Cardinal [Del Monte] […] a young man, playing the Lute, who seemed altogether alive and real with a carafe of flowers full of water, in which you could see perfectly the reflection of a window and other reflections of that room inside the water, and on those flowers there was a lively dew depicted with every exquisite care. And this (he said) was the best piece that he ever painted”. Both the dew on the flowers and the elaborate refraction effect in the carafe can be seen in the painting displayed here, and these matching details allow it to be identified as the painting described by the biographer. Notes taken from La natura morta italiana da Caravaggio al Settecento [The Italian Still Life from Caravaggio to the 18th Century], exhibition catalogue, Palazzo Strozzi, Florence, 26 June – 12 October 2003. Milan: Electa, 2003, p.138. Known for her dazzling and elegant displays in the music of the later Baroque, the Milanese singer has also nurtured, across her career, the more delicate and nuanced art of the Italian song repertory from the early 17th century, a time when courtly and polyphonic expression were giving way to the moving of the emotions by a solo singer accompanied by a single instrument. La bella più bella sees that queen of Baroque music, Roberta Invernizzi, sailing gracefully across the terrain of such monody in songs composed by the likes of Girolamo Kapsberger’s, Giulio Caccini, Barbara Strozzi, Luigi Rossi (whose dream-like piece provides the album with its title) and Claudio Monteverdi.